Though difficult to decipher his signature, I believe this letter was written by Assistant Surgeon James L. Adams (b. 1836) of the 162nd New York Volunteers. From the letter we learn that he was still hoping to receive a promotion to the rank of “full surgeon.” At the time he wrote the letter, he was on duty at the General Hospital in Baton Rouge where he indicates that he has been since about the 1st of July. We also learn that he had served previously served in a similar capacity with the Army of the Potomac in the Peninsula Campaign (summer 1862). I believe this James L. Adams is the same individual by that name who enlisted in June 1861 as a hospital steward with the 5th Michigan Infantry. While serving with them in the Eastern Theater, he was promoted to Assistant Surgeon in July 1862. Regimental records indicate he left the regiment in January 1863. Three months later, he was commissioned a 2d Assistant Surgeon with the 162nd New York Infantry at Franklin, Louisiana. The records of that regiment indicate that he became ill and was absent from the regiment in Baton Rouge for a time before assuming his duties. When he left the regiment in February 1864, he was still at the rank of 2nd Assistant Surgeon. He may have later been the same James L. Adams who was commissioned an assistant surgeon with the 137th New Infantry in August 1864. The recipient of the letter was a Union officer named “Leman,” I believe. Whether this was his first or last name, I am unsure. He may also have been a surgeon because in reminiscing, the author speaks of their days together at the Fairfax Seminary Hospital near Alexandria, Virginia, where the author was assisted by a Mrs. Ramsay as “chief aid.” I cannot find anyone by the name of Leman (if that is a correct transcription) in the 162nd New York Infantry, but the movements of that regiment do correlate with those of the recipient of this letter. Though the lack of the author’s confirmed identity diminishes the value somewhat, the content is quite interesting. The author shares his frustration with the lack of cooperation by the cooking department of the hospital at Baton Rouge in carrying out the doctor’s prescriptive diet for convalescing soldiers, causing unnecessary deaths. He claims that the officers on duty at Baton Rouge — including surgeons — were preoccupied with recovering cotton and sugar stockpiles for the Union. I was surprised and gratified last evening by the receipt of your letter. I say surprised because I had already fancied you as miles beyond Berwick City enroute for the Rio Grande — luxuriating upon hard bread, pork, &c. — and above all as having abundant opportunity to gratify your extreme fondness for horseback exercise. In fact, I fancy you at this moment as “gallantly bestriding your Mazeppa” and astonishing the whole division — cavalry, artillery, & infantry — with your display of equitation. Well, Leman, when next you are in Baton Rouge, I shall despair of affording you any real amusement, except I take you out to ride. Some ten days since I received a letter from your friend Mrs. Everett news that the Ladies of the Charlestown Aid Society had forwarded to my address on the 20th of August by the Steamer “Circassian” ¹ three boxes — all marked Hospital Stoves. I have been constantly on the watch but have been unable to get any trace of the three boxes. I fear that they have been appropriated by some of the hospitals in New Orleans. Certainly they have not reached New Orleans. I am very glad to know that you are again in New Orleans as you may possibly be able to learn something of these boxes. The contents are such as would be extremely useful to me here and I dislike exceedingly to lose them. Moreover, I think the ladies of the Charlestown Society will be much disappointed. The hospitals in New Orleans have comparatively little need of the articles sent to me, while here they will be of the utmost value. Since you were here, I have lost three good men, everyone of whom died not from disease — because I had fortunately relieved them so far that they were able to dress themselves & walk about — but solely from want of suitable amount of nourishment. It is altogether bad and most discouraging to the surgeon. It amounts to nothing that we cure the disease if we have not the means of providing proper diet. A man who is convalescing from a long attack of typhoid fever, complicated with chronic diarrhea or dysentery must have something more nourishing than tea or coffee without milk, sack beef &c. Why I think myself fortunate when I can give my worst patients beef-tea-broth and milk (containing sixty or seventy percent of water) five times a week or chicken broth or eggs at even longer intervals. A. Ham said it ___ all bad. The cooking department of this hospital is worse than poor. It is harmful. There is no system. The cooks are masters and the surgeon here to _____ report their forbearance and good feeling. They do not hesitate to change the diet list whenever they feel disposed to do so. This very noon I found one of my diarrhea patients — for who, I had ordered milk diet — luxuriating upon boiled (half boiled) potatoes, lukewarm tea, and a thick slice of sack beef. It is more than I can endure and I do not always limit myself to simpler adjectives. Yet it is idle to make complaints. I have reported the condition of things until I am weary and I have sworn to say no more on the subject. I can only direct such diet as I consider most necessary for the patients & if they do not get [it], why certainly I am not to be held responsible. If I were to write an account of what I have seen and know & experienced in this hospital since the 1st of July last, it would fill you with indignation. And what makes the matter the more shamefully wicked without it is all unnecessary. But I have already spoken enough on this subject. Remember Leman, this is not an official letter. To return to the boxes, the Circassian was to have sailed from Boston on the twentieth of August last, and must have reached New Orleans during the first week of September. Now I think the best course for you to take is this — find out when she reached New Orleans & to whom she was consigned. By going to the office of the [Daily] Era and looking over the files of that journal for the month of September, you can readily find out the date of her arrival and the agents to whom the cargo was consigned. Then call upon these agents & you will possibly learn about the boxes. This is the only way I can think of. I should have acknowledged Mrs. Everett’s letter some days since but I feel very reluctant to have to say to her that I had not received the boxes so long as any hope of getting them still remains. They certainly are worth an effort. I shall now wait until I hear from you. My health is still far from being good, but I attend to business constantly and keep along after a ______. I am exceedingly lonesome. Can’t you manage to come up and spend two or three days with me? Let me hear from you as soon as maybe. I shall be very anxious to learn the result of your efforts too in the matter of these boxes — their contents most valuable — just what I have so much needed. The mails are so irregular between this point & New Orleans that I am afraid this letter may not reach you in time to make any inquiries. I do not know how long you are to remain in New Orleans, yet from the address you have given me I fancy you may be in town some weeks. Let me know something of your recent movements. Were you on that famous expedition to the Sabine Pass? ² If so, I should think you could forthwith resign all connection with the army and go North. If that movement is an example of the future of the Texas Expedition, I should certainly prefer to be out of the entire affair. I can’t understand the necessity of going to Texas. Certainly Mobile is a more important point since all connection with the rest of the Confederacy is not cut off [in Texas]. And then too, I do not understand that the number of troops is sufficiently large to overrun that huge state & then ___ _____ the high authorities are supposed to comprehend all the strong points of this new campaign, Certainly they should know. Have you heard from Fairfax Seminary ³ since I saw you last? I would give a months’ pay to be ordered back to “the high school.” When I recall the last winter, I am genuinely homesick. I did thoroughly enjoy myself then. After my long service in the field through the hard campaigns of the Peninsula, the Rappahannock, and Maryland. My quarters at the High School were absolutely luxurious (by comparison). You can hardly conceive how pleasant everything sounds to me. Then too, I was always fortunate in having no difficulties with any single one connected with the hospital. All my wishes & directions were carried out to my perfect satisfaction. By my faith, I would rather be back there as a simple Assistant Surgeon with yourself & Mrs. Ramsay as my Chief Aide than to hold the best staff appointment Gen’l. Banks could give me in this Department. Things are all managed here so differently from the manner which is usual in the Army of the Potomac. Here there is no ____ order or discipline nor anything after the proper forbearance. Officers of every staff — surgeons as well as others — are deeply engaged in cotton & sugar operations — to the great detriment of their patients too. ¹ The Circassian was an iron screw steamer that served as a supply ship for the East and West Gulf Blockading Squadrons. Between 17 December 1862 and 11 April 1865 she completed nine cruises from New York City or Boston, Massachusetts, delivering supplies to ships and stations along the Atlantic coast and in the Gulf of Mexico as far west as Galveston, Texas, and up the Mississippi River to New Orleans, Louisiana. On return trips she carried men due to be discharged, invalids, prisoners of war, cotton and provisions. During this time she also captured two prizes and participated in the search for the Confederate steamer Florida in July 1864. In the Official Records of the Union Navy, we learn that the Circassian encountered strong head winds at sea on its way to the Gulf and passed through a violent hurricane on 27 August 1863. She put into Charleston on the 28th and delivered a large store or ordinance for the fleet operating there. Continuing on to the gulf, the Circassian was apparently detained in mid-September by its participation in the blockade of the Sabine River. ² The author is referring to the Second Battle of Sabine Pass which took place on 8 September 1863. It was a failed attempt by the Union army to invade Confederate Texas and accomplished nothing. 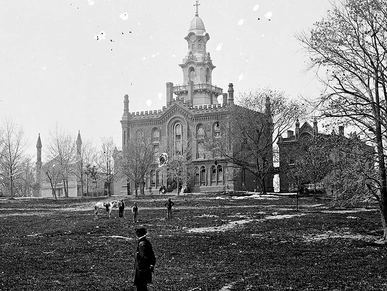 ³ The Fairfax Seminary Hospital was a Union Hospital within the bounds of the defenses at Alexandria. The hospital served 1700 soldiers during the war time. 500 were also buried on the Seminary’s grounds.